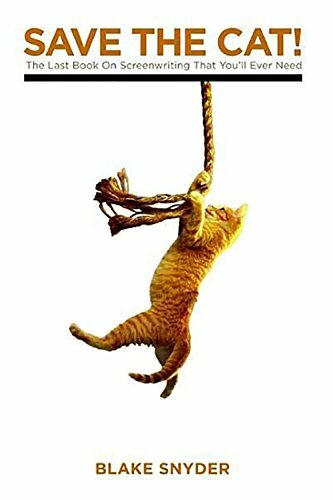 Save the Cat: The Last Book on Screenwriting That You’ll Ever Need by Blake Snyder has been on my to-read list for quite a while. I don’t have any particular aspirations to write screenplays, but I know learning about writing from all different viewpoints is helpful, and this one had been recommended to me as a particularly good book. Save the Cat is entertaining and enlightening. Spoiler Alert: The title comes from the part of the movie where unsympathetic protagonists do something to endear themselves to the audience, such as saving a cat. What resonated with me the most about this book and that I can most closely apply to my own writing is the idea that I must know what my book is about, including the who, what, when, where, why, and how. It also reinforced the importance of the elevator pitch or very short summary you can spit out in a breath or two when someone asks you what your book is about. Save the Cat essentially gives a formula for writing screenplays that may make it to the mainstream movie theaters. I enjoyed reading about the author’s movie genres and found the discussion of beats instructive, though the beats of what I write are different than what you’d find in a movie screenplay. I would agree with those that recommended Save the Cat as a good book to read regardless of what you’re writing and encourage you to do the same. An edited version of this post original appeared on the Book Marketing Tools website in March, 2015 (click here to view it). When you ventured into the author world, you likely pictured reading a glowing review of your book in a major publication. At some point after publishing your e-book on your own, reality set in: the big reviewers will not accept self-published books. Part of it is because of the poor-quality reputation that self-published books is slowly eroding. Part of it is logistics – limiting submissions to traditionally published books is a good way to reduce the volume to deal with. But, a review is still a credible way to make people aware of your book and get them interested in it. It’s also inexpensive, often only costing time, a book copy, and maybe some postage. As with a lot of aspects of self-publishing, it just takes a bit more work and creativity. Independent Publisher (http://www.independentpublisher.com) states “we review these books to bring increased recognition to the thousands of great – and often overlooked – independently published titles released each year.” To access current guidelines, click “How we choose books for review” under the “Review” tab on its website. Midwest Book Review (http://www.midwestbookreview.com) states on its website that it “gives priority consideration to small publishers, self-published authors … whenever possible.” Check their website for current requirements. Goodreads (http://www.goodreads.com) is not only a great place to connect with readers, but it also offers several promotional options for authors. Once you sign up for an author account, make sure your book is listed; if it isn’t, you can manually add it. This will make it available for users to add it to their virtual bookshelves, rate, and review it. If your book is newer, hold a giveaway; winners are encouraged by Goodreads to review the books they win. The more you participate in group discussions and in shelving, rating, and reviewing books you read, the more exposure you get for yourself and your books, making receiving reviews more likely. Search your book’s genre and the phrases “e-book review” or “e-book reviewer.” Also try “e-book review blog,” “free e-book reviews,” “self-published e-book review,” and “independent e-book review” along with various plural and synonym combinations. Visit some of them to see if any of the reviewed books are by self-published authors and if your book might fit in. Check their review submission guidelines and give it a try. If all else fails, contact the site administrator to ask if they review self-published e-books. You can find website statistics at Alexa.com to determine potential exposure for any review. Be sure to also ask if they cross-post their review on Amazon or Goodreads. Groups that provide a designation or stamp of approval may not review your book, but at least they provide some validity and statement that your book meets some minimum quality standard. IndiePENdents (http://www.indiependents.org) offers the IndiePENdents seal. After becoming a member, you can submit your book. If you receive the seal, they will send you stickers to place on your book covers. Brag Medallian (http://www.bragmedallion.com) is a similar program; it used to be free but now they charge a $20 fee which covers the cost of buying the e-book and other expenses. Evaluators may choose to post a review on their own. Local publications are much more likely to be hungry for material; the less populous your area, the better. Browse several newspapers and magazines to see if they include any book reviews; then research their website or contact them to inquire about submitting your book for review. Don’t limit yourself to your own city; check publications for less populated areas in your state or neighboring states, too. Publications may not have a reviewer on staff but accept freelance-written reviews so you may need to contact review authors directly to ask about submitting your work for review. Submitting books for reviews is like querying and submitting to agents and publishers. Make sure you book fits in with others they’ve reviewed and follow the guidelines exactly. Like agents and publishers, reviewers regularly receive numerous submissions so you don’t want to give them a reason to reject your book before reading it.